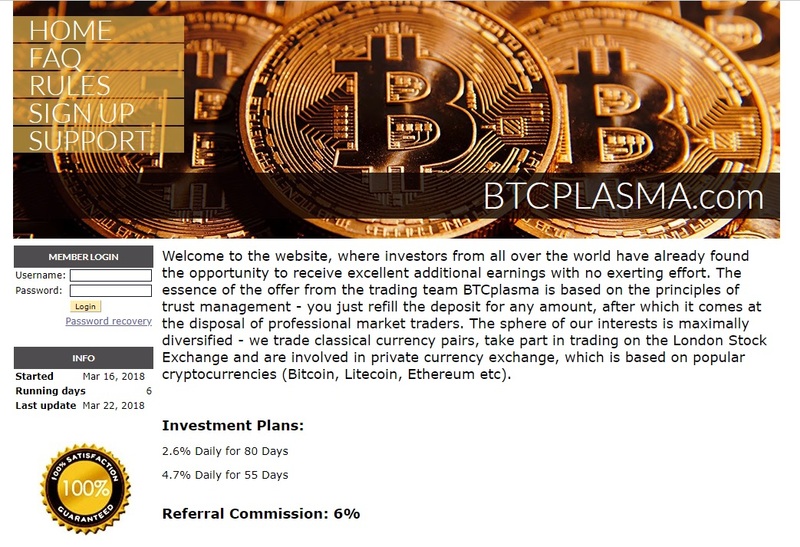 BTCplasma is an investment program that can allegedly make you profits thanks to trading stocks and cryptocurrencies. There are two investment plans, with 2.6% and 4.7% returns per day. This means up to 141% per month. 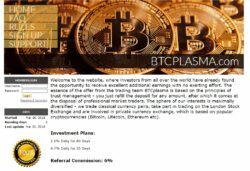 This time you can even find it on their website, BTCplasma admit their program is a HYIP, which means a High Yield Investment Program, which means a scam. There is no real business activity going on behind the scenes, there is only an illegal financial game, a Ponzi scheme that will pay profits using new deposits until it all collapses. So, do not invest any money with BTCplasma, it can go down any time. BTC Plasma is a scam that is flawed by design, it is an illegal scheme that is going to collapse. Stay away from it. If you want to try real crypto trading, do it on a free demo account with a regulated broker. Be sure to understand all the risks before you start to trade with real money.